Oh no..!! Aprk Zuckerberg’s Twitter, Pinterest, LinkedIn Accounts Hacked. This is not new news, This was happened on 5th Jun. 2016. Mark Zukerberg who is founder of Facebook, has been targeted by hackers on his Twitter, Pinterest and LinkedIn accounts. 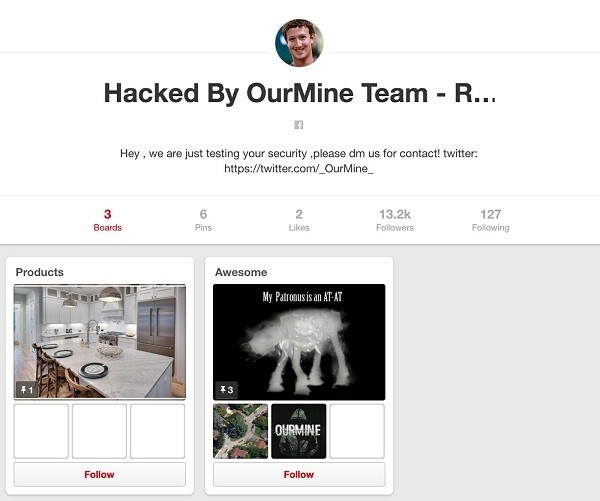 “OurMine Team” Hacker group has taken responsible of his social account hack. Mark’s Facebook account was not among the compromised profiles but mark’s Pinterest, Twitter and LinkedIn Account were compromised, You can see below screenshot which is taken by Engadget, In below Screenshot Hacker (OurMine Team) message just before they are ban and removed. Hacker tweets in mark’s twitter account, Zuckerberg’s issues began after he made the mistake of using the same password on every social account. So Hacker were able to login in Mark’s social accounts by using the same password . This written post indicate that hacker group “OurMine Team” hacks his account. Amazing point is that Hackers don’t hack Mark’s Instagram Account. That means we can say Instagram’s security systems is the best that prevented hackers to access Mark’s account. 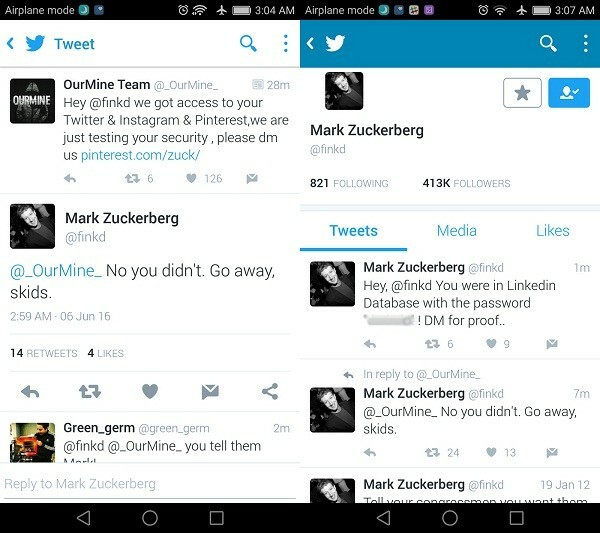 The OurMine Team hacker also posed and claimed that he has hacked Mark’s LinkedIn Account. This hacking of Mark’s Account reason may be of using the same email and password for the multiple social accounts. This article is taken from many source and news paper. « How to download Facebook videos without Any software, Must try..!